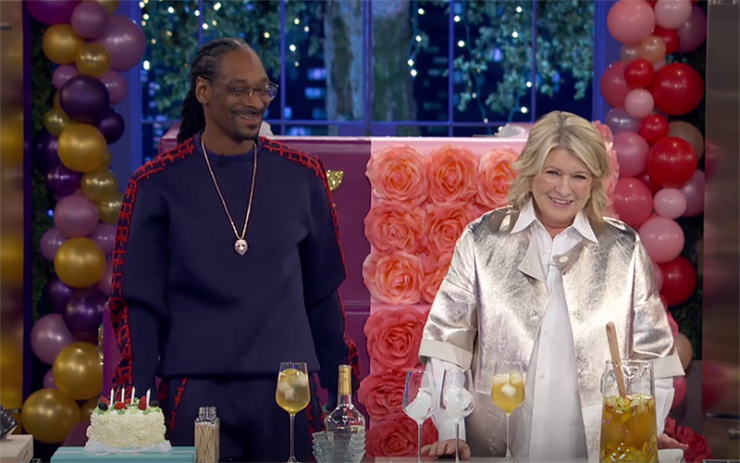 Snoop Dogg and Martha Stewart have teamed up for a cooking show on VH-1. The two may seem like opposites, but surprisingly it works. Martha’s side of the studio is decked out with styling from her Macy’s kitchen collection; Snoop’s is blinged out in gold appliances with an Impala grill fronting his food prep island. The multiplatinum rapper and the ‘street cred’ homemaker premiered season 2 of their show, “Martha & Snoop’s Potluck Dinner Party,” this week. The Chicago Tribune writes, “Her show with Snoop is a very particular cultural exchange between two people of seemingly disparate backgrounds, which is a thing America could use more of these days, frankly.” Uncle Snoop will sit down with crazy lady Ellen on “The Ellen DeGeneres Show“ this Tuesday to discuss his new cooking show with Martha Stewart, a rumored new album and his views on American politics. Catch Snoop Dogg on “The Ellen Degeneres Show” this Tuesday, October 17th. Check your local listings for showtimes. Hottest ticket in town. #MarthaAndSnoop invite celebrity friends over for cocktails, cooking and conversation. Watch the season 2 premiere on @VH1 tonight at 10/9c with special guests #JamieFoxx, #PattiLaBelle & #CharlieWilson. Oct 27 new snoop Dogg. ????? ?